The module illustrates the method of merging two digital paintings together that are drawn separately. In the previous modules a tree and an Indian Sadhu was created in digital painting. In this module the illustrator shows that the same can be merged together to create a meaningful scene. At the end of the illustration it is shown that an Indian Sadhu is meditating under a tree in a forest. Such paintings are usually done in animation films, graphics etc. This technique offers immense creative possibilities. It is preferable to use Pen tablet or tablet monitors rather than just the computer mouse in creating digital paintings as the painter finds it easy to paint and the results are better. In this illustration, Photoshop CS5 is used. There are other application software's like Corel Painter, Sketch Book Pro, Art Rage, GIMP, and Krita etc. that can also be used. Adobe Photoshop CS5 has been used for illustrating this composition. The video demonstrates the various tools including Drawing and Painting tools, Editing tools etc. that have been used in creating this composite composition. 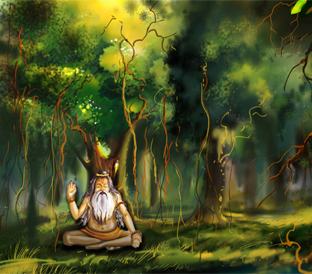 The final result is a digital illustration of the sadhu meditating sitting under a tree in a forest. An understanding of fundamentals of appropriate scale and proportions, concepts of light and shadow, understanding of perspective principles becomes important in generating a realistic illustration as seen in the final composition. In this composition various brush tools, lasso tool, fill tool, sizing tool, transform tool, layers have been used during the illustration. You will appreciate the immense possibilities that digital illustrations offers to enrich your creative urge in drawing and illustrations.